In my house, Christmas in July is hyped up enough to almost rival the December holiday itself. Because the 4th was essentially the last holiday until Halloween, some festivity is definitely needed to distract from the eminent back to school grind coming in the next few weeks. 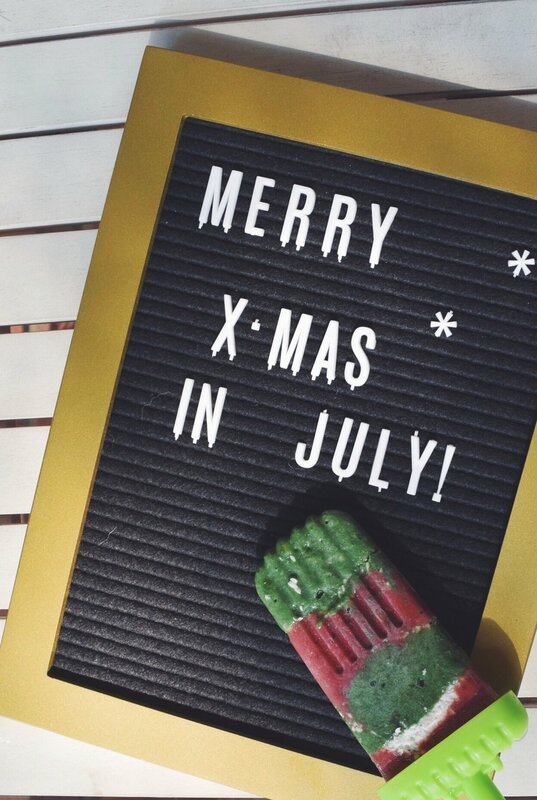 So whether you choose to celebrate July 25th by watching White Christmas, decorating your room, or even just going to Muddy's for one of their Christmas in July goods, I hope that you allow some holiday spirit to creep into your summer's day! Pour around one cup of almond milk (8 oz) into a blender along with the cacao powder, maple, cloves/cinnamon, soaked cashews, and coconut butter. Blend for about 30 seconds. Crush a couple of mint leaves with your hand and place them in the bottom of your glass. Fill the glass halfway up with ice and then pour in the blended mixture. Enjoy! Recently I've been super into smoothie pops so why not make some themed ones to celebrate? Although you will need a popsicle mold to make these, they are such a cute and simple idea to assemble. Enjoy! Separately mix the two colors together in a blender. Place in the freezer for approximately 4 hours and enjoy! Sweet potatoes are an essential part of any winter holiday for my family. So, if I can incorporate them into a summer dessert, I'm definitely going to do it! A take off of my sweet potato pie smoothie bowl recipe, this dish screams festivity. Whether you eat it as a snack or as a dessert, I hope it sends you back to cozier times! Roast a peeled sweet potato wrapped in tin foil for approximately 1 hour on 350 degrees. Wait for it to cool a bit before continuing to step 2. Blend all of the filling ingredients together in a blender. Put the blended filling into a bowl and let it chill for at least 2 hours. Once the filling is chilled, blend together the all of the ingredients for the crust in a blender. Pull out the filling from the fridge and add more spices as needed. Layer the crust and filling layers in a bowl and enjoy!